This installment of the Starfarer’s Codex-series clocks in at 17 pages, 1 page front cover, 1 page editorial, 1 page SRD, 1 page advertisement, leaving us with 13 pages of content, so let’s take a look! Now, the first thing you’ll notice regarding these class options, is that gunslinging herein is not limited to the options of a new class; instead, there is a variety of ways to get the respective gunslinging tricks you want. Operatives may choose the gunslinger specialization, which has Intimidate and Perception as associated skills and allows for the use of Perception to make trick attacks. As a specialization exploit, you can choose any gunslinger ability of 9th level or lower. At 11th level, you may choose one gunslinger ability of 18th level or lower. You may select a possessively named ability, even if you have already selected abilities from other possessives. This is obviously a nomenclature issue, since the term is not clarified later. Instead, this should refer to method abilities. A soldier gunslinger can select the gunslinging fighting style as either primary or secondary fighting style (not both), granting you a gunslinging ability at 1st,5th, 9th, 13th and 17th level. Abilities of your character level or your soldier level +1, whichever is better. There also is a gunslinger archetype: This requires proficiency in small arms, longarms or sniper rifles. At 2nd, 4th, 6th, 9th, 12th and 18th level, you may choose to gain gunslinging abilities. There also is a Gunslinger combat feat, which lets you choose one gunslinging ability of your character level or less; it may be taken multiple times. Now, we’ve been mentioning these gunslinging abilities a lot, so let’s take a look at them! These abilities are organized by level and belong to specific methods – basically ability trees/families. The limitations imposed on characters regarding their choices is a neat idea – but it would have been even neater with an actual list/table listing the methods available. As written, you have to extrapolate the methods available from the respective ability-write-ups, which is an unnecessary comfort detriment. The abilities per se are pretty interesting and do some creative things, even when referring to Pathfinder abilities that tended to elicit tired yawns in the original: When a ranged attack would theoretically miss you, you can choose to take it to stagger a few steps (10 ft.) around dramatically, taking minimum damage. The ability may be used more often than once, but doing so requires Resolve Point expenditure to do so sans resting. I also really liked the ability to set up basically turrets and similar traps – the rules here are tight, though, in a potentially confusing decision, the ability does not specify whether it uses Engineering or Mysticism to disable the traps placed. I assume Engineering, since it makes more sense, but theoretically, magical weaponry and the like would make sense with Mysticism as well. Some guidelines there would have been very much appreciated. Better harrying fire, heavy armor proficiency, scaling grenade tricks. I am not 100% happy with the ability that nets fortification from the get-go: It does cost Resolve and a reaction to use, but considering the price of force fields that provide an unreliable means of negating critical hits, this does seem like a bit overkill for a 1st level ability. That being said, gunslinger’s dodge is actually fun here: It lets you move and nets an AC-bonus against the triggering attack, so yeah, it can actually matter. Nice one! There also is an interesting one that lets you create experimental weaponry that could inject e.g. vials or even spell ampoules at range, though at the cost of increased reloading durations – all of these special tricks do have their drawbacks to avoid breaking the item’s power. Like it. Pistolero, on the other hand, pretty much is a bit creepy for me: It allows you to execute a full attack as a standard action when wielding only small arms, and while it does have limitations imposed and an anti-abuse caveat, I am not sold on it: While the solarian’s solar acceleration zenith revelation has additional tricks added, it’s significantly higher level than 1st, and Starfinder’s increased ranged combat focus does make the movement more valuable. More nasty: Full actions do prevent swift action use, and this ability allows the gunslinger to avoid this limitation. It’s not *necessarily* broken, but for future-proofing, I’d definitely further elaborate upon the limitations this should have; as written, it only prevents full action or standard action-based attack options, and it’s probably just a matter of time before swift action-based tricks enter the fray. Making a last reaction shot before being knocked unconscious, however, is a nice one. Determining randomly which target to shoot can net you a bonus, and there is a nice support ability as well. At range dirty trick (with trick attack synergy, if available!) and unlocking the soldier’s grenade expert at 3rd level, would be two examples for well-placed abilities regarding their power. Making precisely-aimed penetrating shots is also an angle I very much enjoyed, and quicker reloading for signature weapons is neat as well. Knockdown when hitting targets twice, with one of the hits being critical, is similarly a fun one. Rendering foes flat-footed that are subject to harrying fire or covering fire makes for a nice 6th level ability. Targeting shots and similar classics have been translated to Starfinder in often creative ways. I also liked the staggering warning shot. It should be noted that, starting 9th level, we no longer get a metric ton of new abilities for all methods – only 3 per level-range are provided, with only Gun Tank and Ace Shooter having high-level exclusives unlocked at 12th level for the taking. All in all, while I do consider some of the abilities potentially problematic and pretty strong, I found myself liking this section very much. The next section is pretty damn cool: Dare feats. Dare feats are unique in that they are inactive most of the time. As long as you have Resolve, the Dare feats are inactive: They only kick in once your Resolve runs out! As soon as you regain Resolve, the Dare once more becomes inactive. Anyone can take these, and they are interesting in that they could have easily been broken. Making smart use of Starfinder’s significant enemy concept, the regaining of Resolve via the specific conditions provided by the feats is not cheesable. Big kudos – I think this concept could carry even more! 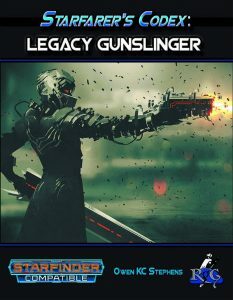 The final section provides the gunslinger base class: Dexterity is the key-ability modifier, 7 + Con Stamina, 6 HP, 5 + Int skills per level, proficiency with basic melee weapons, grenades, small arms, longarms, sniper weapons. You gain Weapon Specialization for all weapons this class gets proficiency with. The class has full BAB-progression and goo Ref- and Will-saves. 5th level and every 4 levels thereafter nets a bonus feat, and the class starts with 2 gunslinger abilities and gains more at most levels – except those that net bonus feats of the grit ability increases. Grit is gained at 7th level and is 1 point that acts as a Resolve Point that may only be used to stay in the fight or to power gunslinging abilities. It does NOT qualify for having Resolve left – nice catch! The first time per day you kill or critically hit a significant enemy, you regain 1 Grit. 11th level and every 4 levels thereafter increase grit by +1. The class table is wrong here: 15th level should read “Grit+3”, 19th “Grit+4.” 7th level provides a decreased penalty with ranged full attacks; 13th level the three attack full attack and the capstone makes the gunslinger count as always having 1 Resolve left for gunslinging abilities. One gunslinging ability costing Resolve also does not cost Resolve anymore. Editing and formatting are very good on a formal and rules-language level, though not perfect: the class table glitch is nasty, and there are a couple of instances where the otherwise precise rules-language could be a tiny bit more specific. Layout adheres to Rogue Genius Games’ two-column full-color standard and the pdf sports quite a few really neat full-color artworks. The pdf comes fully bookmarked for your convenience. Owen K.C. Stephens flexes his design-muscles here, big time – while it may not have sounded like this in my review above, but this, from a design-perspective, an amazing pdf to read: Starfinder is a complex game, and writing rules-syntax for it is potentially harder than for Pathfinder. After all, accounting for general archetypes and critical effects, etc. adds to the things you have to bear in mind. Now, that being said, this is SUPER-impressive, as befitting of the Starfinder design-lead! I tried *really* hard to poke some holes into this book, but frankly, I couldn’t come up with much: Apart from typo-level glitches, a few instances noted above, and the table glitch, my main concerns here lie in the future-proofing of a scant few abilities. That in mind, I am left with a few minor hiccups and said concerns, which leave me at 4.5 stars, rounded up due to in dubio pro reo. That being said, this is mechanically intriguing in multiple ways and manages to even make abilities that were bland in PFRPG matter in their new iterations. For this, the pdf does get my seal of approval. My favorite SFRPG-book by Rogue Genius Games so far, and a worthy addition to the game!! You can get this damn cool supplement here on OBS!